Passable Saturday afternoon babysitter rental for the kiddies. As talking-dog movies go, "Good Boy!" could have been worse. 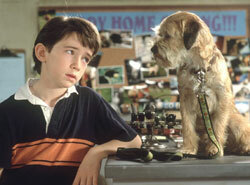 The story of a outcast boy named Owen (Liam Aiken) who is empowered with the ability to communicate with canines when he adopts a cute, crash-landed border terrier from outer space, it's a kiddie picture that starts strong with some freshly funny twists on obvious jokes ("Hey, I drank out of that bowl!" the dog barks after seeing the kid use the toilet). But after a likable first act of awkward bonding as the kid tries to help the critter he's named "Hubble" repair a distress beacon (apparently the mutt isn't familiar with his own technology) and adjust to life on Earth, the plot goes to the dogs. It seems that man's best friends were sent to our planet eons ago to take over, but they got lazy. Now The Greater Dane is coming for an inspection, and it's up to Hubble (provided a listless, low-key voice by Matthew Broderick), Owen, and an eclectic foursome of neighborhood hounds (voiced by Brittany Murphy, Donald Faison, Delta Burke and Carl Reiner) to make it look like dogs rule the Earth. "Good Boy!" never rises above its gimmick again. Writer-director John Hoffman adopts a lackadaisical, it's-just-a-kids'-movie approach to conceptual plot holes, stereotyped bullies, oblivious parents (ham-fisted "Saturday Night Live" alums Kevin Nealon and Molly Shannon), disingenuous tear-jerking and rudimentary, pat-on-the-head life lessons ("Home isn't where you are, it's who you're with."). A silly sense of humor and the put-upon Everykid screen presence of young Aiken ("Stepmom," "I Dreamed of Africa") should be enough to keep the pre-teen target audience happy, but parents will likely be disappointed watching the movie's early promise go to waste.